This step by step diy project is about easy chicken coop plans. Building a small backyard chicken coop is a complex project, but the construction will be durable. 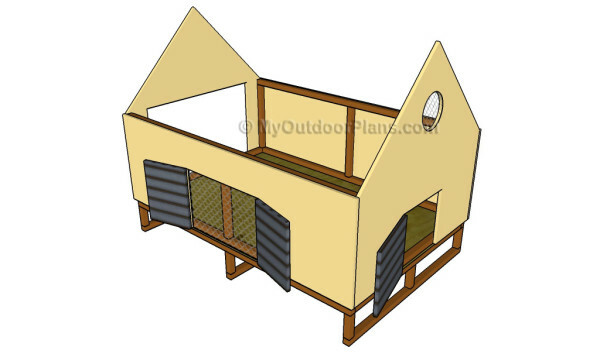 There are many plans that you can choose from when building the backyard chicken coop, so you should really pay attention to the related projects on this site before starting the actual construction of the shelter. It is essential to use weather-resistant lumber when building the chicken coop, so make sure you select the components with attention. Moreover, take accurate measurements before making the cuts, otherwise the components might not fit together. 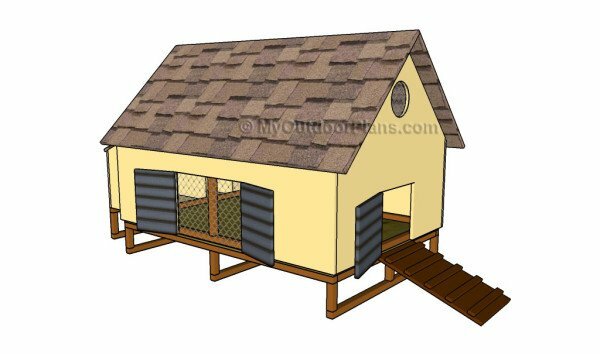 Adjust the size of the chicken coop according to your needs, but make sure you follow the instructions described in this article. It’s that simple to build a chicken coop! The first step of the woodworking project is to build the base of the chicken coop. 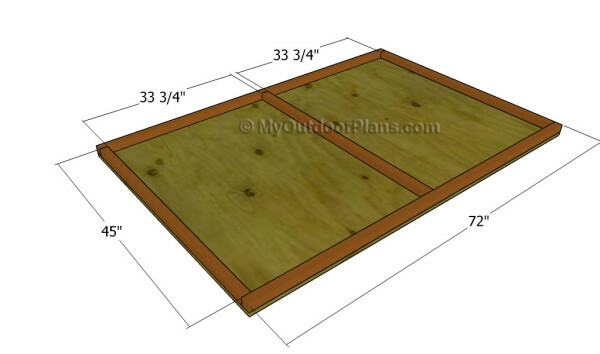 Therefore, we recommend you to build the floor out of 3/4′ plywood and the frame out of 2×2 lumber. Cut the 2×2 components at the right size and lock them together with 2 1/2″ pocket screws. Center the frame to the plywood sheet and drill pilot holes. Next, insert 1 1/4″ screws into the frame and add glue to create a rigid structure. 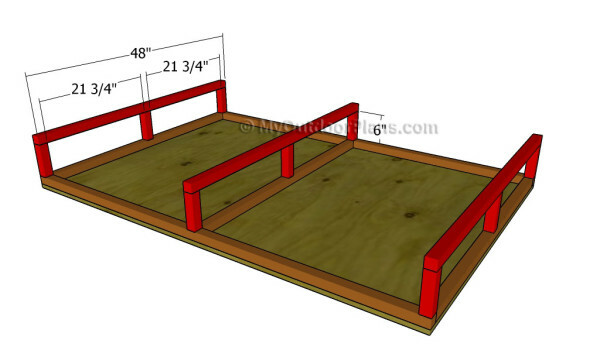 Continue the woodworking project by attaching the 2×2 legs to the base of the chicken coop. 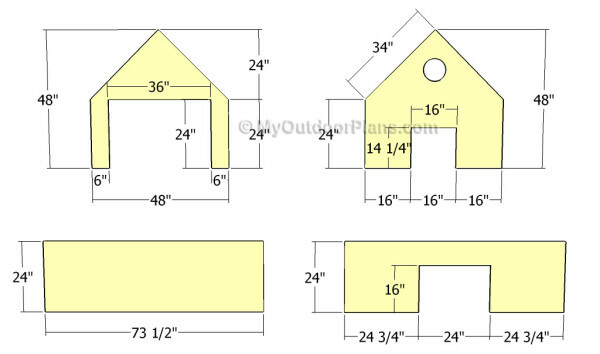 Cut the components out of 2×2 lumber after taking accurate measurements. Drill pocket holes at both ends of the vertical supports and insert 2 1/2″ screws into the horizontal supports. Make sure the corners are square and leave no gaps between the components. Work with attention and add glue to the joints. 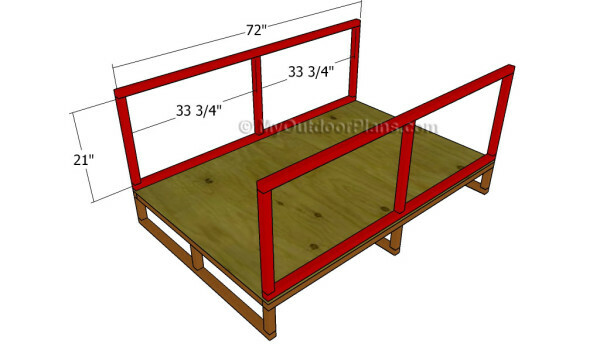 Continue the project by attaching the side walls to the chicken coop. 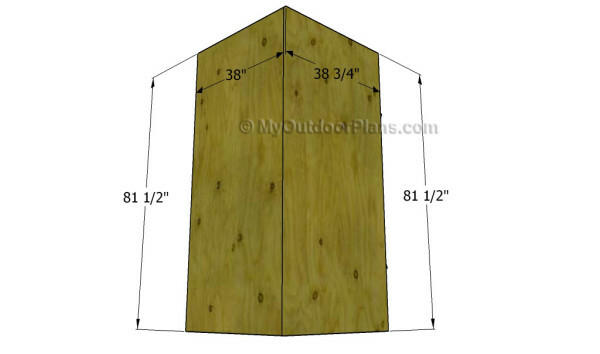 As you can easily notice in the plans, we recommend you to assemble the walls out of 2×2 lumber on a level surface. Drill pilot holes through the top and bottom plates and insert 2 1/2″ screws into the studs. Make sure the corners are square ad drill pilot holes through the bottom plates before inserting 2 1/2″ screws into the floor. Continue the assembly by attaching the horizontal supports to the structure. Drill pocket holes at both ends of the 2×2 components and fit them between the sides of the chicken coop. It is essential to mark the cut lines to the 3/4″ plywood sheets before making the cuts with a circular saw. Make sure you create the door and window openings properly, before attaching them to the frame. Smooth the cut edges with sandpaper thoroughly. Attach the plywood walls to the wooden structure and secure them into place by using 1 1/4″ galvanized screws. In addition, use metal hinges to lock the door and the window shutters into place. Align everything with attention and secure the walls to the frame tightly. Build the top ridge out of 2×2 lumber and secure it to the top of the roof using galvanized screws. Place a spirit level on top of the slat to to make sure it is perfectly horizontal. Top Tip: In addition, build the rafters out of 2×2 lumber, making sure you cut one end at 45 degrees. Fit the rafters into place and secure them to the structure with 2 1/2′ screws, after drilling pilot holes. 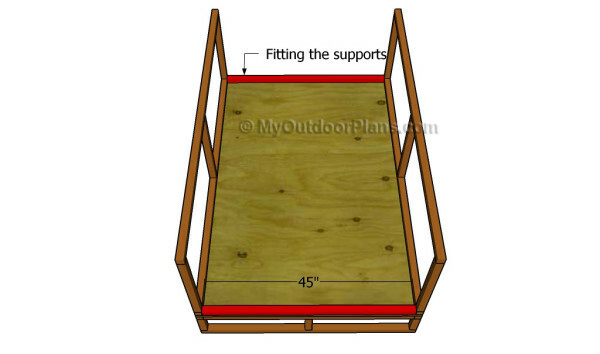 Afterwards, attach the 3/4″ plywood roof to the chicken coop. Cut the components out of 3/4″ plywood and secure them to the rafters with 1 1/4″ screws. Leave no gaps between the components and make sure the front and the back overhangs are equal. One of the last steps of the project is to attach the roofing to the plywood sheets. Therefore, we recommend you to cover the roof with tar paper. Staple the tart paper to the plywood roof and afterwards attach the asphalt shingles. 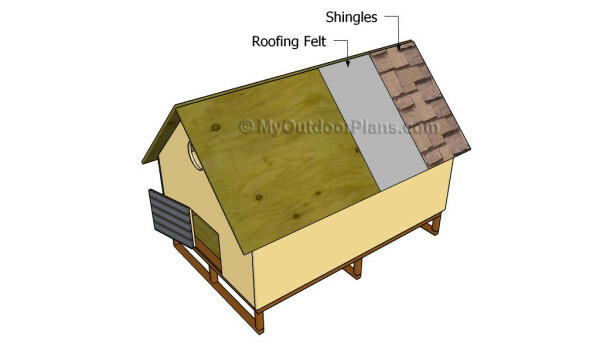 Take accurate measurements and secure the shingles to the roof using appropriate nails. After building the frame of the chicken coop we recommend you to take care of the finishing touches. Therefore, check if all the components are locked together tightly and aligned properly. Top Tip: Don’t forget to take a look over the rest of the project, if you want to learn how to build the nesting box for the chickens. In addition, in the next parts of the project we show you how to fit the trims. 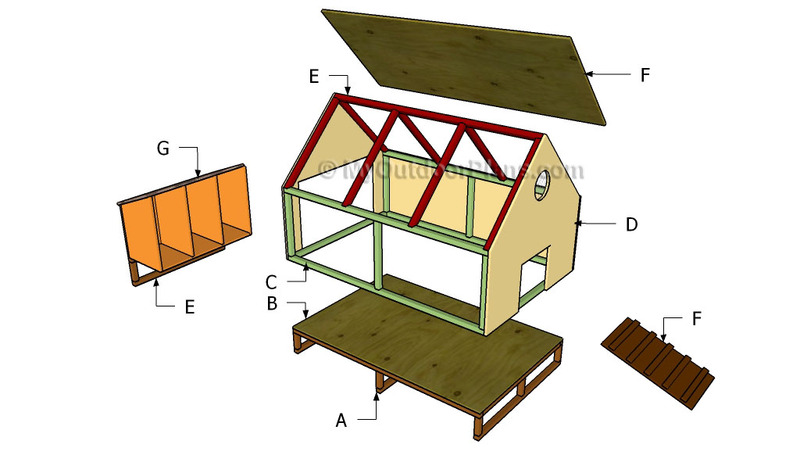 This woodworking project was about easy chicken coop plans. If you want to see more outdoor plans, we recommend you to check out the rest of our step by step projects. LIKE us on Facebook to be the first that gets our latest updates and submit pictures with your DIY projects. in the beginning when it says to put 1 1]/4 ‘ screws in 2×2 how is that possivble?? It is possible, as it says to drill pocket holes and use 2 1/2″ pocket screws. You are not reading correctly. It says that you are screwing the plywood to the frame with 1 1/4″ screws! What’s the measurements for G and E ? how many chickens will this coop be good for? 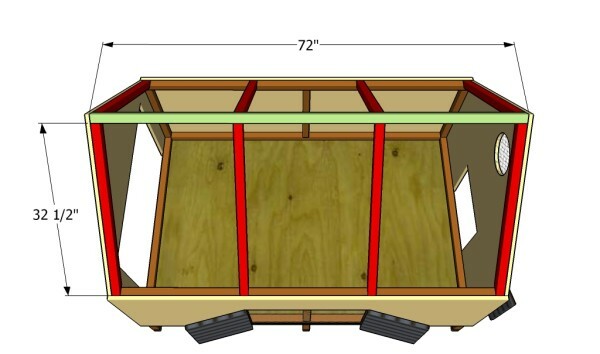 I am about to build this coop this weekend. I am hoping to modify the desing with a hinged roof. I have the logistic down of how to do this but does anyone have any ideas on how to prevent water from getting through the hinge? I was thinking of adding a piano style hinge to the nest box lid and could probably use a piano hinge for the roof as well. Any advice is appreciated. Could this be made with taller side walls and maybe 7 or 8 ft long? We are almost done building ours. We made our frame with posts & 2×4’s so it’s higher from the ground. We also used 4’x8′ sheets of plywood for the longer walls to eliminate cutting & make it bigger. Also, we put the chickens door on a long side where the window is suppose to be and we put a large clean out door on a short side opposite of the nesting box. I’ll post a picture as soon as we finish the trim & paint. 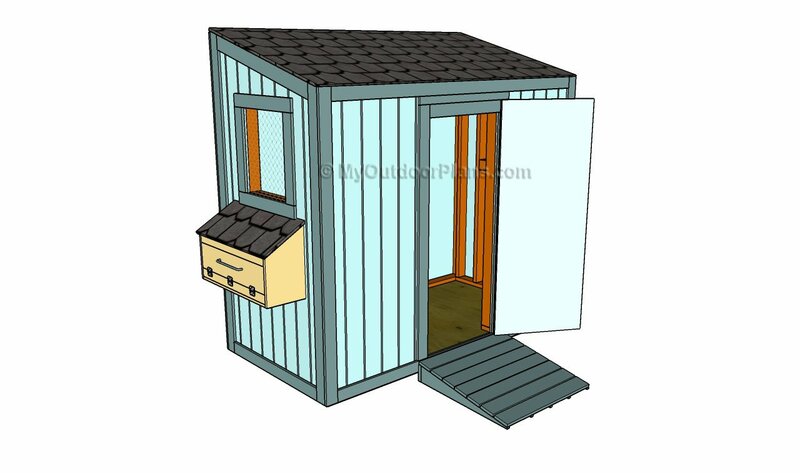 Hello there, I am thinking of building a chicken coop using the Easy chicken coop plans. I really want to make this a bit taller by adding 10″ to the bottom legs and 10″ to the exterior walls. Does this sound feasible? Hi there! I had a question about these plans if you don’t mind. How are you supposed to work in the coop? Is one side of the roof liftable? Thanks! Yes, you can install hinges so you can open up one side of the roof. How would you clean this coop? I see the comments posted above and I’d like to put the roof on a hinge but don’t see a way to do so without letting water in. Any ideas? Thank you. You cover the hinges with tar paper and shingles. In this manner, the water won’t leak inside. I like the simplicity of this design, but where do the chickens roost? Would dowels added at the top of the walls work? Are there plans for the shutters and doors? The doors and the shutters are the pieces you cut out from the walls. Would there be a way to make it so that you can slide out the bottom floor or put something in to slide out so it would be easy to clean? You could add hinges to the roof. That would be a lot easier to implement. Almost had it all assembled before we notice no way to clean the coop. Wish I had read the comments. Putting a hinge on the roof didn’t seem feasible as that piece of plywood is really heavy and the structure of the house is 2x2s. Curious to hear back from others how that went for them. We made half of the long side (the one without the “window”) a side opening hinge for cleaning. How far from the end of the vertical support do you start your pocket holes? How do I access the full plans? Please read the FAQs. Also, see the PREVIOUS / NEXT buttons at the bottom of the articles. Any chance there would be a list available of the full size lumber needed (before cuts are made)? I am trying to figure out the cost of the materials in total. Fit insulation between the frame and then attach 1/2″ plywood to the interior. Nothing too complicated. Can you put a roost in there?